Jiffylite S/S #4 Mailer - 9.5" x 12.5"
Bubble pouches made from durabubble are available in stock and standard sizes. Opening tolerance +3%, -2%, minimum 1/4", depth tolerance +/-1/4", lip tolerance +/-1/8". Manufactured from 3/16" durabubble. Pouches manufactured with 1" lip + tape. 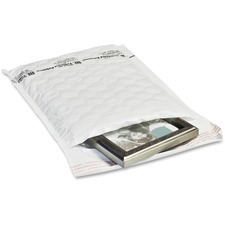 Sealed Air #0 Jiffy Padded Mailer - 6" x 10"
Rugged, all-purpose, paper fiber cushioned mailers. Outstanding product protection - Heavy duty kraft with uniform inner batting provides maximum cushioning protection throughout the shipping cycle. Size: 6" x 10". Sealed Air #0 Jiffy Padded Self-Seal Mailer -6" x 10"
Sealed Air #0 Jiffylite Self-Seal Mailer - 6" x 10"
Air Cellular Cushioned Mailer. Standard/Heat Sealable. Outstanding shipping protection for a wide range of semi-fragile, low profile items. 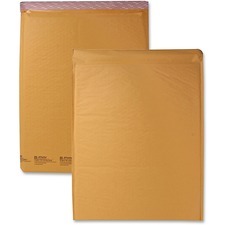 Sealed Air #000 Jiffy Padded Mailer - 4" x 8"
Rugged, all-purpose, paper fiber cushioned mailers. Outstanding product protection - Heavy duty kraft with uniform inner batting provides maximum cushioning protection throughout the shipping cycle. Size: 4" x 8". Sealed Air #1 Jiffy Padded Mailer - 7 1/4" x 12"
Rugged, all-purpose, paper fiber cushioned mailers. Outstanding product protection - Heavy duty kraft with uniform inner batting provides maximum cushioning protection throughout the shipping cycle. Size: 7 1/4" x 12". Sealed Air #1 Jiffylite Self-Seal Mailer -7 1/4" x 12"
Sealed Air #2 Jiffy Padded Mailer - 8 1/2" x 12"
Rugged, all-purpose, paper fiber cushioned mailers. Outstanding product protection - Heavy duty kraft with uniform inner batting provides maximum cushioning protection throughout the shipping cycle. Size: 8 1/2" x 12". Sealed Air #2 Jiffylite Self-Seal Mailer -8 1/2" x 12"
Rugged, all-purpose, paper fiber cushioned mailers. Outstanding product protection - Heavy duty kraft with uniform inner batting provides maximum cushioning protection throughout the shipping cycle. Size: 8 1/2" x 14 1/2". Sealed Air #4 Jiffy Padded Mailer - 9 1/2" x 14 1/2"
Rugged, all-purpose, paper fiber cushioned mailers. Outstanding product protection - Heavy duty kraft with uniform inner batting provides maximum cushioning protection throughout the shipping cycle. Size: 9 1/2" x 14 1/2". Rugged, all-purpose, paper fiber cushioned mailers. Outstanding product protection - Heavy duty kraft with uniform inner batting provides maximum cushioning protection throughout the shipping cycle. Size: 10 1/2" x 16". Rugged, all-purpose, paper fiber cushioned mailers. Outstanding product protection - Heavy duty kraft with uniform inner batting provides maximum cushioning protection throughout the shipping cycle. Size: 12 1/2" x 19". Rugged, all-purpose, paper fiber cushioned mailers. Outstanding product protection - Heavy duty kraft with uniform inner batting provides maximum cushioning protection throughout the shipping cycle. Size: 14 1/4" x 20".